Chapel is a vibrant place where music is played, conversation is had, laughter is present, and thoughtfulness is abound. 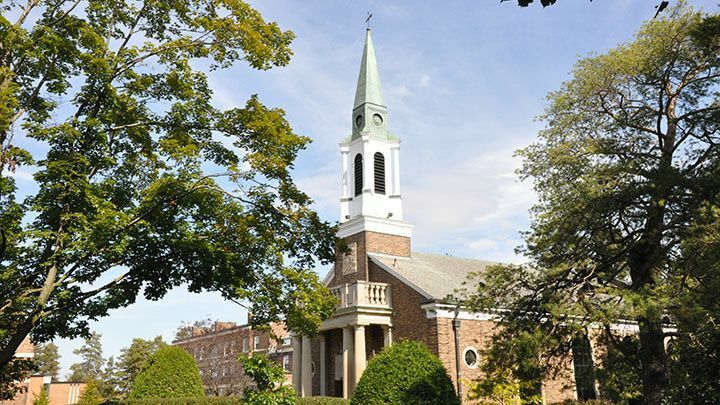 In short, Chapel aims to replicate life, a place where mindfulness is paramount, but also a place to spend time with friends in a unique, shared experience. Chapel not only fosters pastoral care but, through its curriculum, addresses the relevant and important issues of the St. Andrew’s community. Chapel is a memorial to those who fought and died in the Great Wars of the 20th Century and the chapel of the 21st century respects the traditions of the past while moving forward and addressing the needs of the St. Andrew’s student of today. And, perhaps most importantly, Chapel attempts to emulate life in a most significant way. 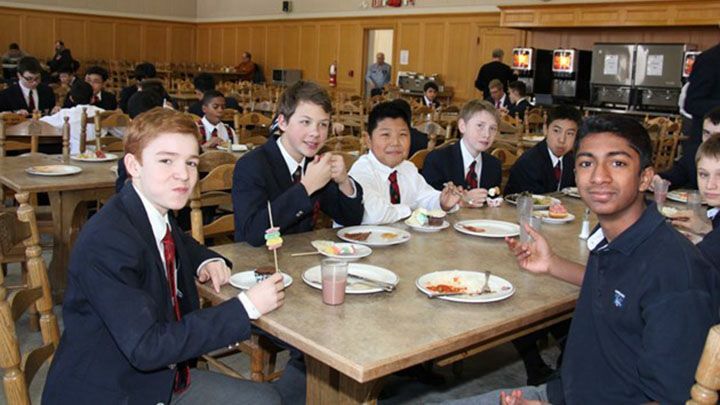 Middle School students and faculty gather twice weekly for a time of reflection, motivation and inspiration. There is a high level of participation by the boys as they are often encouraged to contribute to the meditation with their comments and thoughts. Often the message is taken into the classroom or sporting venues, where it has a direct impact on the activities of the day. The Reflections of a Prefect chapel series has been an influential part of the chapel program and has provided the younger students of the college to learn and grow from the thoughts and reflections of each of the current prefects. Twice a month, a prefect will speak directly to the boys of the Middle School and reflect on their journey at St. Andrew’s. 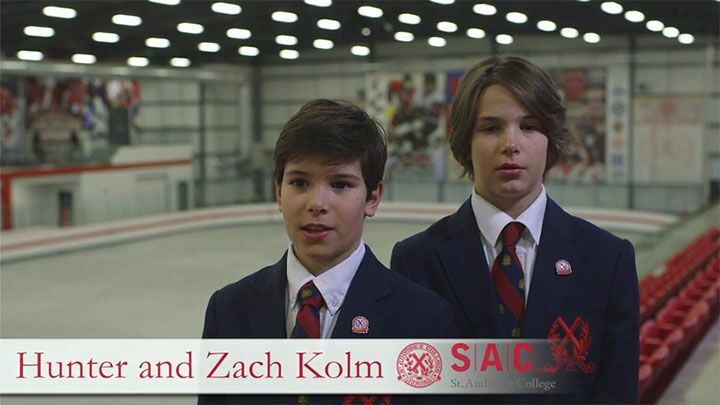 As well, Faculty are encouraged to add to the “Stories of Us” series by speaking to the boys about their experiences of leadership and growth, as well as overcoming hardships and adversity. Music plays a large role in Chapel. Music is also important for An Andrean Christmas at Roy Thomson Hall, and rehearsals are held during Chapel in late November and early December. Throughout the year there are special services such as the Thanksgiving Prayer Circle (a whole-school event held on the Quad), Remembrance Day, and Prize Day. The Chapel is under the direction of David D. Stewart, Chapel Coordinator, and Mr. John Clements, School Organist. Dr. Macdonald carried the pastoral responsibilities of Chaplain himself. He conducted morning services with readings from Scripture and prayers. “Evening prayers took place after the evening meal. He conducted a Bible Class on Sunday afternoons at 3:00 p.m. All the boarders were expected to attend the church of the denomination to which their parents belonged.” There was a Sunday Chapel service at night at which Dr. Macdonald preached. Over the decades, the religious life at St. Andrew's has accordingly changed. There has been a succession of Chaplains of various denominations, and the services have become more responsive to changes in society, becoming less formal and including debates, discussions, concerts, and student sermons. Today, as the student body has become more religiously diverse, elements from other faiths, prayers, and readings have been added. Efforts have been made to make the time more inclusive of the whole community by encouraging involvement by both students and teachers. 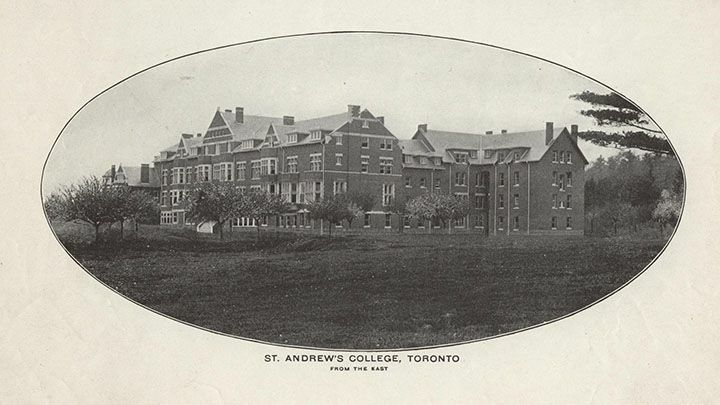 Throughout the history of St. Andrew’s, Chapel services have been conducted in a variety of venues, including the billiards room of the original Chestnut Park in Toronto. When the move from Rosedale to Aurora was being planned, the construction of a Chapel was included in the original plans. However, the Memorial Chapel was not completed until 1931, five years after the School opened. Services were held for five years in a section of the library which was set up like a meeting hall. Sir Joseph Flavelle, then Chairman of the Board, contributed $70,000 toward the building of the Chapel. It was designed by E. H. Paisley, formally of Marani and Paisley, the School's original architects. It is in the Georgian style and features a portico with heavy stone pillars at the west front and a twisted red brick steeple reaching 94 feet high. The entrance is framed in plain stone with the Jesuit motto, Ad Maiorem Dei Gloriam (To the greater glory of God), above the door. It seats approximately 300 people. The interior is simple and dignified with large windows, providing an abundance of light. The chancel is paneled with walnut and gum-wood. It is called the Memorial Chapel in memory of the 106 Andreans who gave their lives in the First World War – 104 Old Boys and two masters. A commemorative tablet bearing their names was originally placed in the chancel close to the communion table. The foundations of the Chapel were laid in March 1930 and it was consecrated on Sunday, May 10, 1931, before it was completely finished. Canon Henry John Cody took the first service and dedicated the Chapel. Master Percy Robinson read the names of those who had died. The Headmaster, the Rev. D. Bruce Macdonald, preached about common responsibilities to which the ideals of the Chapel point. Following the Second World War, another commemorative tablet was added to the Chapel with the names of the 45 Andreans who died in that war. The First World War tablet was moved from the chancel so that the two tablets were on either side of the chancel. Later, during the tenure of Headmaster Tom Hockin, a large fabric hanging, which included stylized figures reaching up to God and the decussate cross of St. Andrew's in the background, was hung over the communion table. At the back of the Chapel are flags representing the various countries from which Andreans have attended over the years. In the corner is the flag of the #142 St. Andrew’s College Highland Cadet Corps. Throughout the Chapel are plaques memorializing people who have contributed significantly to the Andrean community, along with memorabilia from the First World War. Excerpts taken from Not an Ordinary Place, the historical account of St. Andrew’s College (1999). Tuesday: 8:15-8:30 a.m. for Middle School.